While we’re waiting for that AppleTV update . 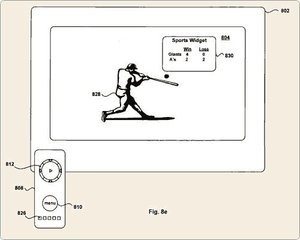 . .
Apple is teasing us with a patent filing that hints at a rosy future for the AppleTV. It includes everything from widgets appearing on the screen, to a new widget-enhanced remote control, to iChat instant messaging, to — get this — broadcast television. Yep. The AppleTV could become an actual set-top box capable of receiving broadcast television signals and recording to a hard drive like digital video recorders (DVRs). To realize the “Multi-media center for computer systems”, Apple could either make enhancements to the existing AppleTV (version 3?) or develop an entirely new device that would act as a central multimedia hardware hub. (ArsTechnica). In the filing, Apple describes “Telephonic or Cable TV Based Widgets”, “Display of Real-Time Information Widgets”, and live iChat session widgets. Apple’s Front Row Remote, used to control the AppleTV as well as the Front Row program on Macs, features new widget keys. In the real-time information example, Apple describes a viewer watching broadcast content such as “live” sporting events on a display device, presumably a high-definition television. Through a set-top box, most likely an AppleTV of some sort, users could manually or automatically use widgets to download information from a television broadcast or from another communications link — the Internet, an ethernet connection, an RSS feed, a wireless source. What’s interesting is that the AppleTV is not — yet — a live set-top box capable of receiving over-the-air broadcast signals. AppleTV plays video, mostly television shows or movies, purchased through iTunes. Once the software update is available (supposedly any day now), people can also rent movies from iTunes using the AppleTV interface. Could Apple one day expand the AppleTV, or develop a new device, into an actual set-top box with broadcast/DVR capabilities? 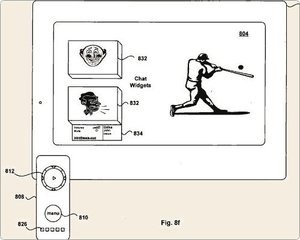 Because Apple files gobs of patents — it filed 46 along with this one — it does not mean that an AppleTV broadcast-capable set-top box, or even the widgets, will ever be made. But it’s fun to think about future possibilities, especially as we wait for the AppleTV update. See also: AppleTV 2 breaks free from the PC, remains under Apple’s lock and key; and, CES: PC-to-TV devices, Internet-connected TVs. AppleTV is not the first product to envision this type of user experience. Remember the old AOLTV service? It included overlays like this, including chat and instant messaging features tied to the channel being viewed. Very cool for its day. AOL has approved patents for these and other technologies. There were also synchronized games to play along with broadcast TV, and news and sports scores, and interactive tie-ins with TV commercials. Why do patent applications use language and look like they are being written in the 19th century?